After a whopping nine weeks atop the Billboard Hot 100, Ke$ha's debut single "TiK ToK" has finally been unseated after holding off worthy attempts at usurpation by the likes of Lady Gaga, Young Money, Lady Antebellum, and, most notably, the combined efforts of Barbra Streisand, Justin Bieber, Josh Groban, Wyclef Jean and dozens of other musical big shots. Fittingly, the folks ultimately able to displace the lightweight pop juggernaut are none other than the equally unstoppable Black Eyed Peas, who with new number one single "Imma Be" from 2009 album The E.N.D. (The Energy Never Dies) become the first act to have three singles from one album since Wilson Phillips' self-titled debut album spawned three number ones in 1990-91. It says "be" and there's a bee in it! The Peas have been no strangers to the Hot 100's apex recently: the first two singles from The E.N.D. spent a record-breaking 26 consecutive weeks atop the chart ("Boom Boom Pow" reigned from April 18 to July 4, then "I Gotta Feeling" took over July 11 through October 10); the album's third single, "Meet Me Halfway ," peaked at number 7 in November 2009. 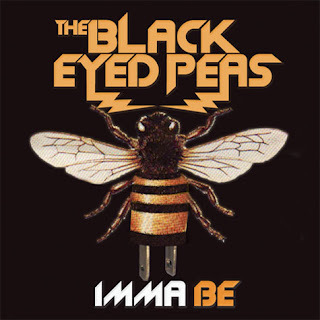 "Imma Be" made a brief appearance at number 88 on the July 4 chart (the final week of "Boom Boom Pow's" stint at the top), but although Entertainment Weekly predicted it would be a summer smash, "Imma Be" faded amid the behemoth that was "I Gotta Feeling" and only resurfaced on the Hot 100 on January 2, 2010 at number 93. What likely would have been its first week atop the Hot 100 was spoiled by the release of "We Are the World 25 For Haiti" during the opening ceremonies of the Vancouver Olympic games, after which the charity single shot to the top of the Digital Songs chart, where it remains this week; without radio airplay, however, the group effort failed to knock radio favorite and still strong downloader "TiK ToK" off its pedestal, and "Imma Be" sat patiently in third. With the release of the futuristic mega-music video "Imma Be Rockin' That Body," which paired the fast-rising aspirational club thumper with buoyant dancefloor track "Rock That Body," as yet not released as an official single, the Peas solidified their takeover attempt and handily won the day. In other chart news, Sade's long-awaited new album Soldier of Love became the first to hold onto the top spot on the Billboard 200 for a second week since the other recent chart monster, Susan Boyle's I Dreamed a Dream , began the second of its six non-consecutive weeks at number one on December 19, 2009. Meanwhile, Lady Gaga's "Telephone" (featuring Beyoncé) inched up one spot to number 14 on the Hot 100 and from nine to eight on the Radio Songs rankings, while bouncing to number 5 on the Pop Songs in advance of the also long-awaited music video (which Gaga has said to be "a real true pop event"), which premieres this weekend.